As a pragmatic-idealist young graduate student 25 years ago, I was dissuaded from pursuing further academic work in the field of my interest by the dominance of the neo-classic economic perspective at that time, which -- aside from the irritating pomposity of many of its adherents - -also just seemed to me to be not only depressing, but also just plain wrong about so many situations. So rather than argue, I finished up my Master's degree, tried out a couple of different jobs, and ended spending the last 20 years as a lender and advisor to dozens of small to medium-sized consumer, worker and housing cooperatives. Much of what I have observed in the field bears out the prescience of Elinor Ostrom's work on the nuance of collaborative action - we can and do right by each other when conditions are conducive to it, and we are all the better for helping each other. Early in my career as a community development lender to a range of small, often struggling food cooperatives, I was just amazed at their resilience - stores that by all the rules of the marketplace should have closed years before just kept on going, bolstered by waves of volunteer members and in many cases, by the assistance of fellow-food co-ops as well. The local food co-op was not a collective "resource" in the sense that Ostrom discusses it, like water or forest or fishing grounds. Most people didn't depend on it for their livelihood, and in many cases they could get the same products more easily (and cheaply) at investor-owned stores. Yet it was clearly perceived as a shared asset, and one that many would and did go out of their way to protect and nurture at no immediate or even discernable financial advantage to themselves. Food co-ops are still the most collaborative of cooperative sectors that I have worked with, and a neat example of the one of the most useful concepts in the Ostrom cannon, that of polycentricity. Polycentricity - the pairing of local control with higher level shared governance and/or services both general and specialized - has only recently evolved in the food co-op sector, although it was contemplated decades earlier. Now with the establishment of the National Cooperative Grocers Association and its uniform supply contract, for example, member co-ops can purchase together as a "virtual chain" from the major national wholesaler providing significant savings. Such a shared purchasing agreement requires, however, that each member effectively guarantee the purchases of the others in order to access the savings. This has necessarily led to some formal standardization of expectations of financial performance of each member , but in keeping with the Ostrom model, these "rules" of performance did not come from some outside rating agency, but rather from the food cooperatives themselves (design principle 3). Even more interesting is the competitive/collaborative peer process that has evolved to encourage/assist member co-ops in achieving these standards. Using the felicitously-named CoCoFiSt system (standing for Common Cooperative Financial Statements) each member submits their quarterly financial figures, and is rewarded with a detailed feedback on a wide variety of performance measures comparing their store's performance to similar-sized stores in their region. Members naturally compete to be the best in their class, but also collaborate to improve overall sector performance. While member co-ops do not mete out formal "sanctions" as in for under-performing peers (principle 5), the existence of timely and specific data coupled with the informal sanctions of peer pressure do the job. The success of this collaborative approach in the finance arena has led to the development of similar peer support networks in other areas of store operations such as HR, marketing, and the management of various departments, a development which also fits in with Ostrom's idea of polycentricity, which includes the organization of both general and specialized jurisdictions. Fortune magazine reported last year that the Park Slope Food Coop (PSFC) had sales of $39.4 million in its previous fiscal year. This translated into $6,500 average of sales per-square-foot. By a rough comparison this is significantly better than leading chain stores. For example, Trader Joe's led its competitors that year with an average of sales per-square-foot of $1,750, and one estimate has Whole Foods? doing less than $850 per-square-foot. The existence of a polycentric development framework is the hallmark of the three most successful cooperative development systems in the world - the worker-owned co-ops of Mondragon in the Basque region of Spain, Northern Italy's vast and diverse network of different kinds of cooperatives, and the provincially-led system of support and development in Quebec, where virtually every resident is a member of one or more cooperative. All of these development systems are typified by local control of individual co-ops, coupled with strong and responsive shared institutions providing technical assistance, insurance, trade opportunities, and most importantly, finance. In Italy co-ops are organized both by sector and by geography, and often at the municipal, regional and national levels. Italian law encourages the re-deployment of cooperative profits for common purposes by effectively exempting from taxation those funds that are designated permanently for common use (they must be passed on to another co-op or cooperative development agency in the event of dissolution and can never accrue to the advantage of individual members). American tax law incents just the opposite behavior - common profits that are distributed to individual members rather than retained for the collective good receive the tax advantage. Not surprisingly, the cooperative economy of Northern Italy also turns on its head another sacred tenant of neo-classical economics - the supposed "trade-off" that must exist between income generation and inequality. When I took development economics in the early 1980's, we were shown a graph with per capita income on one axis and a measure of income inequality on the other with a straight line running at a 45 degree angle between them - as per capita income rose in any country, so "must" inequality of the distribution of that income, so the theory went. The region of Emilia-Romagna in Northern Italy, however, with its rich cooperative history and sizeable cooperative sector, defies this conventional wisdom and leads the European Union in measures of both high average income and low inequality, further evidence that a collaborative approach to resource management in the form of economic development can yield better results for all. Many Italians in the cooperative movement link the strength, pervasiveness, and resilience of their cooperative institutions to conditions of their birth at the close of the second world war. Worker-owned cooperatives in Emilia-Romagna were seen both as a key defense in the democratic struggle against fascism, but also on a more practical level as a vital instrument of self-help job creation for a region devastated by war. Today, these worker cooperatives are still viewed in a fundamental sense more as a resource to be stewarded, rather than a reward for individual achievement. When I asked a member of a very successful worker co-op in Italy once, why the members don't vote to sell the cooperative and take their very lucrative portion of the profits he looked at me as if I were stupid and said "If we sold the cooperative, where would my children work?" Italy is a country where the centralized federal government is widely viewed to be ineffective, dysfunctional and even corrupt and thus not a reliable source of assistance for the average worker. For Italians not fortunate enough to be born into property-owning class of shopkeepers and merchants, the cooperatives are a self-made and self-governed common resource that has provided stability and prosperity for generations of workers. ER Imola-Ceramica is a very successful worker-owned ceramic co-op in Imola, which is the most cooperative city in Italy, having the highest concentration of people working for co-ops. Another key finding of Ostrom's that I have seen born out in the real world of cooperation is her observation of the significant contribution that face-to-face communication makes to the overall level of cooperation, another outcome that is not anticipated in the conventional economic literature. In conducting the research for a recent manual I wrote on multi-stakeholder cooperatives (that is, co-ops that invite more than one class of member such as workers and consumers together, to be part of their ownership and governance structure), I found that only modest academic study had been done on this fast-growing sector, but what work had been done conforms very well to Professor Ostrom's overall findings. The best literature review of the topic to date comes from a forthcoming paper by Professor Catherine Leviten-Reid of Cape Breton University. She notes at the outset that traditional economic theory would largely predict the downfall of something as unwieldy as a multi-stakeholder cooperative. Challenged with the high transaction costs necessitated by the involvement of so many parties, these theories would predict that multi-stakeholder organizations would soon revert to one dominated by a single stakeholder group, or else fall apart entirely under the weight of their own competing objectives. As professor Leviten-Reid demonstrates, however, this just doesn't seem to be the case empirically. She posits an alternate theory, whereby instead of thinking of the high transaction costs of involving multiple parties, it may instead be more appropriate to think of multi-stakeholder enterprises as more highly evolved coordinating mechanisms for the collection and coordination of disparate information in the pursuit of common needs. The face-to-face communication of cooperative boards increases their ability to work together in pursuit of their shared objectives. Another interesting piece of research in this area also suggests that it is overly simplistic to reduce each party in a multi-stakeholder co-op to being a poster child for their differences. In fact, the well-being of different constituencies within a multi-stakeholder cooperative is not a zero-sum game - one set of members does not need to win at the expense of the others. In the largest comparative study of its kind to date, Borzaga and Depedri studied over 300 cooperatives. They found that on both social and financial measures, workers fared equally well in cooperatives organized as multi-stakeholder co-ops and worker-only cooperatives - the addition of other stakeholder groups in the co-op did not take away at all from the ability of co-op workers to achieve their aim of meaningful and remunerative employment. The finding that we, as human beings, can create productive structures where you don't have to lose for me to win is a lesson that every economic development practitioner should take to heart. So if co-ops are so great, why aren't there more of them? That is, of course, the perennial questions for practitioners of my ilk. I think Ostrom's work can help us in this regard too, as we analyze the failures we have known as well as the successes. Her observations of the utility of a polycentric approach is a very important one. For the most part, we lack an effective infrastructure for cooperative support and development in this country. The success of countries that do should encourage us all to work to build powerful, yet responsive collective institutions to support the efficient and meaningful deployment and stewardship of cooperatives as community resources on a local level. It is important to remember that many of the cooperative failures we have known are really the failures of any small business - they are isolated and under-resourced, facing markets conditions that have neither the skill nor the information to effectively navigate. The rare cooperative failures are those where certain segments of the membership attempt to hijack the co-op for their own personal or political reasons or two warring factions cannot be reconciled and an otherwise perfectly functional enterprise is brought down. Such co-ops become echo chambers of dysfunction, where poor practice and communication is reinforced by more of the same. Other failures happen when unscrupulous individuals take advantage of a relatively lax legal or financial infrastructure within a particular co-op and simply take the collective assets for their own. Both kinds of failures flourish in an environment of isolation from more functional peer norms. This underscores the importance of another of Ostrom's observation that rules about collective resources work best when they are designed and enforced by those affected by them in the context of a broad movement of similarly-situated organizations and/or individuals. Peer learning has long been an important strategy for food co-ops, and is being implemented in a formal way now by worker co-ops as well, in the form of the U.S. Federation of Worker Cooperatives new Peer Advisor certification program. The importance here is that effective peer learning is not just from peers in an individual cooperative, but rather represents the collective learning of peers across a whole sector of cooperatives. 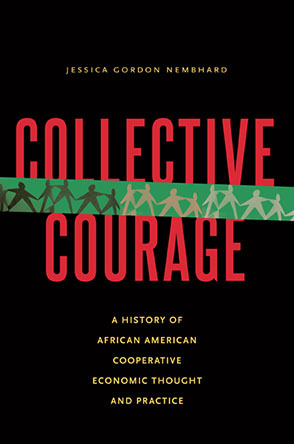 If we considered the cooperative movement as a whole to be our collective resource to prudently manage, we would perhaps look at our work differently and be less likely to tolerate failure. This is not to say that cooperatives do not need the assistance of outside trained experts, because they do. It is to say however, that, as outside helper agents, to be most effective our job is really to help the cooperatives to help themselves, and not to do the work ourselves. A final point of Ostrom's work that particularly resonates for me as a cooperative development practitioner is her observations about the importance of face-to-face communication in producing increased and sustained levels of cooperation. We don't learn how to be effective communicators in school, but we should. Empathy is a vital element of effective democracy, and learning the skills to embrace and navigate differences in a productive manner is a skill that would serve us all in a wide variety of settings both in and outside of work. As Ostrom observes, the majority of people are what she calls "conditional cooperators", they will work together if conditions are right. This aligns well with my own observations that a certain number of us will always be cooperators, a certain number of us will never be, but the vast majority of people lie in the middle. Our job as the diehard cohort is to make our case to this middle ground. This means to make our enterprises as accessible and inviting as possible and be living proof through our thought and practice, that individual and collective good are not mutually exclusive, nor even incompatible, but actually inextricably aligned. The permanent link to this article is http://geo.coop/node/678. Margaret Lund is an independent consultant with a wide range of experience in the community development and cooperative development finance fields. Prior to starting her consulting work, Ms. Lund spent 15 years as the Executive Director of the Northcountry Cooperative Development Fund (NCDF), a community loan fund and multi-faceted development organization for cooperatives of all sectors across the Upper Midwest. Ms. Lund is a past member of the board of Opportunity Finance Network (OFN), the leading national trade association for Community Development Financial Institutions and also of the National Cooperative Business Association, where she chaired a national task force on cooperative capital formation. Currently, she serves on the board of Health Partners, the largest consumer-governed healthcare organization in the United States and a leader in healthcare quality measures. Margaret is a nationally recognized expert in the field of cooperative development finance, and has been featured as a speaker, trainer and panelist for a number of organizations including the National Association of Housing Cooperatives, the National Cooperative Business Association, the Consumer Cooperative Managers Association, the U.S. Federation of Worker Cooperatives, the Meredith Institute for Resident-Owned Communities, the Minnesota Council of Non-Profits, and the Minneapolis Urban League. She was awarded the Howard K. Bowers Cooperative Service award by the Consumer Cooperative Managers Association in 2008. Margaret Lund (2011). Some field observations on the applicability of Elinor Ostrom's work to contemporary cooperative practice. "Solidarity as a Business Model: a Multi-stakeholder Cooperative Manual" available from the Ohio Employee Ownership Center: http://oeockent.org/index.php/library/category/46/cooperatives. Publication number 20. Borzaga, C. and Depedri, S. (2010), "The implications of Stakeholders' Participation on Goals - Achievement and on Performances: the case of Italian Social Cooperatives", paper presented at the meeting of the International Association for the Economics of Participation (July). Paris, France.